Animal trials are a fascinating, albeit perplexing, part of history. While the idea of putting an animal on trial in a court of law for the crime of murder may seem outrageous today, it was not uncommon during the Renaissance. Why did these trials occur? What does the act of bringing a non-human before a human court tell us about the culture of the Renaissance? Animal trials took place predominantly between the 14th and 17th century all over Europe, although they were most prevalent in France, Switzerland, Tyrol, Germany, the Netherlands, and the southern Slavonic countries (Dinzelbacher 406). Animals were tried for a range of infractions, mostly for crimes that resulted in death or harm to human beings. When animals were brought to trial, the action was taken just as seriously as bringing a human to trial. Judges, lawyers, and jurists all took part in the trials and received their fees accordingly. Jailers were paid for the housing of the offending animal before and during the trial. Careful legal records were kept of the trials. Executions, often the sentence in instances where animals had killed humans, were conducted in public by the same professionals who performed human executions (Dinzelbacher 406-7). Why, then, would people who were rational in the following of the law do something as outrageous as put an animal on trial? One theory is that the trials were “nothing more than a manifestation of the primitive lex talionis,” or the law of retaliation (Hyde 721). If animals took the life (or the means of sustaining life in the case of rats and weevils who were often tried for destroying drops) of human beings, then their own lives became forfeit. According to this theory, when people got mad, they had to take revenge no matter who the offender. Another explanation for animal trials was the desire to rid society of the evil that accompanied an act like murder or the destruction of crops, regardless of the perpetrator of the crime. Italian canonist Gratian believed “that [animals] were killed not on account of their crimes but in order that the hateful act might be forgotten” (Hyde 718). For those who had lost loved ones to a loose pig or a rampaging bull, removing the animal from their society would free them from the constant visual reminder of the horrors of the death. For those who saw animal criminality as a demonic attack, ridding society of the offending animal, and thus the means through which evil had harmed humanity, was a cleansing act. What can all of these theories tell us about Renaissance culture? As Peter Dinzelbacher explains, “animal trials took place only under extremely unusual circumstances in order to help the local community cope with an otherwise recalcitrant threat—not because they were proven to work but because they created the impression that the authorities were assiduously maintaining law and order in a cooperative and decided manner.” While there are several theories as to why animals were put on trial, the one theme tying them together is the need for the human being to assert their dominance over the animal and to maintain their status as the supreme being in the natural world. These trials represented “a mentality that placed man above animal in the hierarchy of creation” (Cohen 17). Image: Chambers, R. The Book of Days: A Miscellany of Popular Antiquities. Philadelphia: W & R Chambers, Lippincott, 1862. Cohen, Esther. “Law, Folklore and Animal Lore.” Past and Present 110 (1986): 6-37. Dinzelbacher, Peter. “Animal Trials: A Multidisciplinary Approach.” Journal of Interdisciplinary History 32.3 (2012): 405-21. Hyde, Walter Woodburn. “The Persecution and Punishment of Animals and Lifeless Things in the Middle Ages and Modern Times.” University of Pennsylvania Law Review 64.7 (1916): 696-730. This entry was posted on Friday, May 4th, 2012 at 11:57 am	and tagged with animal trials, law, religion and posted in Law and Social Practice. You can follow any responses to this entry through the RSS 2.0 feed. 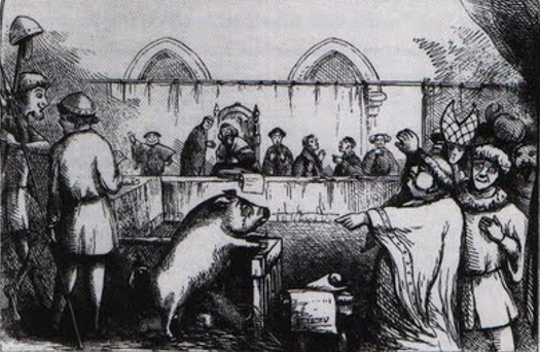 The image is fascinating — the pig isn’t wearing any clothes (though many animals were dressed during trials). His “nakedness” seems to give him authority here when we consider that the humans who _are_ clothed look a little ridiculous. Might this be a commentary? Whereas the humans use socially generated trends to express their humanness, they mimic animals via the clothing materials (leather, feathers, fur) and shapes (hats shaped like bird crests or turtle shells), the animal has no artifice and is always overtly a pig?